Haicang Tourist Area boasts a series of scenic spots represented by the magnificent Haicang Bridge, which witness the development in modern science and technology and demonstrates the greatness of the people. In addition, the area includes Riyuegu Holiday and Amuse- ment Zone mainly for the tourists coming for health recuperation, the Tianzhu Mountain National Forest Park Zone for forest tours and hunt- ing tours, the Qingjiao Ciji Palace Cultural Tourist Zone in memory of Wu Zhenren, and the Haicang Wildlife Theme Park Tourist Zone for observing wild animals, to meet different demands for tours and leisure. It is composed of three sections: Haicang Bridge, Bridge Museum and Fire Island. In the middle of Xiamen West Port, Haicang Bridge is a steel-box floating suspension bridge the first largest in Asia and third largest in the world. It is famous as a flying rain- bow in Dongdu, an inner bay high- way and city bridge linking Xiamen Island with Haicang. Also it is the second outlet of Xiamen Island to Haicang District. It represents China's highest construction level of bridges in the 20th century. The bridge is 5,926.572 meters long with its main section being 3,140 meters long. The towers are of the gate structure while piers are of a smooth curve structure. It is one of the best bridges in China. Against the blue sky, this silver-blue bridge is like a jade belt across the water. The 110 paralleled steel cables suspended on the air to the gate-like towers are a combination of power and beauty. Especially when night has fallen, the bridge in the flood of light is like a beautiful dragon on the sea water. Located on the eastern bank of the Haicang Bridge, the modem museum introduces the bridge-related science, technology, history, culture and knowledge. It is the first of its kind in China. The museum is composed of three sections. The first floor introduces the Haicang Bridge and its construc- tion from different angles. On the first floor there are several demon- stration centers to attract visitors to join. On the second floor is an exhi- bition to review the development of the bridges in the past 100 years. The exhibition hall reflects the brilliant achievements China has made in an- cient and modern times and intro- duces scientific and technological knowledge concerning bridges and well-known bridges from various historical periods of different countries. Also the exhibition hall tells about the great projects to be done in the 21 st century. On the third floor is the supervision and control center of the bridge, or the traffic center of the bridge. The tourists can have an over- all view of the transportation opera- tional guarantee system of the bridge. Fire Island is situated on the sea area west to Xiamen and is the loca- tion of the western end of the Haicang Bridge. It is the first one in China developed into a national AAAA tourist area from an unpopulated island on the sea. The island has fantastic geo- logical structure and colorful rocks. The island illustrates a unique geologi- cal feature of "having islets on the sea and having lakes on the island" and is praised as a "natural geological museum." The island has a spring climate year round, with lush vegetation everywhere. Walking to the Fire Is- land Ecopark along a path, tourists will see lovely squirrels and peacocks in an unclosed zoo. Here, people can experience their exchanges with small animals and enjoy the interest- ing performances by animals. The Zigzag Barbecue Camp on the bank of the beautiful Luxi Lake is large enough for a gathering of more than 300 campers. Going further along the lake, people come to the natural geo- logical museum, a gorge full of col- orful rocks in fantastic shapes. These rocks were formed in the Jurassic period and weathered through many years. They lie quietly here to receive admiration from tourists. Walking down along this gorge, people come to the sea beach where a platform stands for people to view the white dolphins - "giant pandas in the sea." In the evening a water screen film is shown on the Golden Snake Lake, a seldom in the country. The water screen and the starring sky are inte- grated into one and it seems the film figures come down from the heaven, a purely imaginary scene. Viewing egrets quietly in early morning and looking for them in the sunset or waiting for dolphins jump- ing out of the water are main con- tents of Xiamen ecotourism. Egrets have long body, walk lightly on the beaches of Xiamen Island, and fly freely over the city, which are re- garded as the city birds of Xiamen. They add a quality suggestive of po- etry or painting to the blue sky and golden sand beaches of Xiamen. The Chinese dolphins belong to marine mammals, which are in imminent danger in the world. They can be found in groups only at the mouth ot Jiulong River in Xiamen, at the mouth of the Pearl River in Guangdong and in the water area to the north of the Lantau Island in Hong Kong. In Xiamen and the water area around, the dolphins have strong reproduc- tion ability. The Fire Island is one of the best places to view those dolphins. Located in Xiamen Haicang In- vestment Zone, the Orient ( Xiamen) Golf Country Club covers an area of 2.46 million square meters. It is 20 minutes away from Xiamen Gaoqi International Airport by car. The club has an 18-hole international standard golf course, an 18-hole mini golf course and US-style villas. The course was designed by the US de- signer Ronald Fream and built ac- cording to the terrain and other unique natural resources. The fairways are of their own characteristics. The club constitutes a beautiful painting of the customs of a sea port in south Fujian. The club boasts luxury suites, standard rooms and villas, as well as Chinese and Western restaurants which provide various kinds of sea- food and delicious dishes. It is an ideal place for accommodation, ca- tering and recreational activities dur- ing holidays. The Riyuegu Hot Springs Theme Park is located in Dongfu Town in Haicang District in the western part of Xiamen. It is a tourist holiday resort with natural hot springs as main part. The 65,000-square-meter natural open hot spring park is the first gar- den-like open hot spring in Fujian Province. The construction started in 1998 with the investment from Singapore businessmen. The hot springs here have plenty of quality water. The tempera- ture in the surface layer reaches 82~C and that in the deep layer tops 92~C. The water is neutral and moderate and contains carbonate. The various kinds of minerals and trace elements in the water are good for the health and can promote the metabolism, enliven cell organs and thus effectively prevent and help treat various kinds of diseases. This area is composed of spring source cultural zone, Mingtan Island, Peacock Garden, Kangti Garden, Lanyue Spring, Nursery of Young Plants, Swimming Pool, Zone for Soaking in Spring Water and other sce- nic spots. In addition, there are more than 100 natural open hot spring pools for people to stay and some 40 special pools such as liquor hot spring pool, red wine hot spring pool, coffee hot spring pool, milk hot spring pool, co- conut juice hot spring pool, lemon juice hot spring pool, Ginseng hot spring pool, Ganoderma lucidum hot spring pool, Chinese Angelica root hot spring pool, cold and hot spring pools, rose hot spring pool and misty hot spring pool. Spring Source: With a diameter of 12 meters, it is a quality and seldom carbonate hot spring. The spring wa- ter gushes out at a rate of 10 liters per second. The water is neutral and moderate, with its PH value of 6.6. The water is clear, transparent but a bit salty and contains various kinds of trace el- ements including metasilicic acid, potassium, magnesium, calcium, lithium, iron and bromine. The park is located in Tianzhu Mountain Forest Farm, northwest to Dongfu Township in Haicang District. It is 36 kilometers to down- town Xiamen and stands close to the Riyuegu Hot Springs Theme Park. 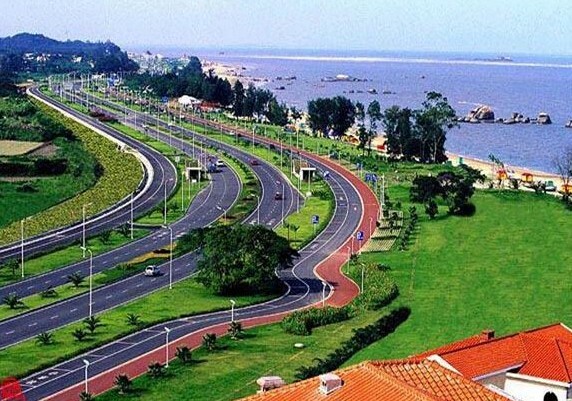 With the Xiamen-Zhangzhou ex- pressway passing through in its south, it has good transportation facilities. This forest park covers an area of 30.813 square kilometers and has its name for fantastic and pillar- like rocks. Tianzhu Mountain National For- est Park has a coverage rate of 96.8 percent and houses more than 1,500 kinds of plants. The ancient tall trees have strong roots, while others have suspended branch roots, having an ecological environment of a typical tropic rain forest or a tropical sea- sonal forest. Most are masson pine trees. The Tianzhu Mountain, the highest, is 933 meters high and the second highest Xianlingqi Mountain is 916 meters above sea level. There are five lakes in the park with a total storage of 10 million cubic meters. Of which the Xitou Lake is the biggest, 11 square kilometers. The forests in the park are picturesque, with rich animal and plant resources. The mountains and cliffs are mag- nificent and lakes are attractive with beautiful scene. The spring water gurgles forward, waterfalls rush down from cliffs, like a water curtain. In addition, there are hide springs. People just hear the gurgling of spring water, but not their appearance. The Tianzhu Mountain boasts many aged cultural sites such as stone carvings on cliffs, Elephant Trunk Rock, Forget-Back Rock, Pantuo Rock, Screen Rock and One- Line Spring. Here tourists can take forest bath, climb mountains, have exploration and hunting tours, enjoy barbecues, have camping in summer or recuperation. This forest park is a rare tourist holiday resort. In the eastern section of Jiaosong Road in Haicang District, this zoo covers an area of 180,000 square meters and is the first theme park in Fujian Province for cultivating, domesticating, demonstrating and generating wild animals and scientific research. It houses more than 2,000 rare wild animals in some 100 kinds from various countries in the world including the white tiger, kangaroo from Australia, flamingo from Cuba, sea lion from South America, and the first-grade and second-grade animals under the state protection of northeast Chinese tiger, lesser panda, red- crowned crane, black bear, etc. The zoo is divided into two zones: one for walking visitors and the other for driving visitors. Most animals are cultivated in open area. Walking in the zoo, visitors seem walking in a world of animals, with zebras from Africa and gazelles running by you, rhinos breathe deeply not far from you, os- triches stroll around you, and small kangaroos stretch their heads out of their mothers' pouches. Here visitors are so close to the animals and enjoy a harmonious existence in nature with animals. In addition, visitors can en- joy excellent performances by ani- mals including those by sea lions or by bears together with lions. The Qingjiao Ciji Palace located on the Dongming Range, Qishan Mountain in Qingjiao Village, Haicang Tai- wan-invested Zone, Xiamen. It is the temple of Wu Zhenren (979-1036), a famous doctor of Northern Song Dynasty. His disciples can be found in Southeast Asia and Fujian and Tai- wan provinces. The East Palace has solemn, mag- nificent and brilliant halls with flying- up eaves. It houses four treasures: a colorful painting of a sacred animal with phoenix head, dragon tail, turtle body and four legs; tablets with in- scriptions on its reconstruction from the reigns of the Qing Emperors Kangxi, Jiaqing, Xianfeng and Guangxu; In the Qingjiao Ciji Palace there is a rock in the shape of Chinese character meaning heart but the point in the middle is at the bottom; and the black-and-white painting on the rafters painted with the paint and in the method of Tang Yin (1470-1523), a famous talent from the Ming Dynasty. The painting is free of plague of insects. The palace has a beautiful and quiet landscape with the Qishan Mountain on its back and Longqiu on its left. To the left of Longqiu on the bottom of the valley is the Longqiu Pool. The water drops down among the rocks. On a huge rock there are two Chinese words Long Qiu. Above the rock there is a rock with a flat top and sounds drum beats while being beaten. This rock is called Immor- tal Drum Rock.